Convert your Paper Based Documents to Digital Images on CD/DVD for Easy Storage and Retrieval. One CD can hold up to 15,000 images! Are you spending hours or days looking for a document on your desk? TKB Associates, Inc. provides a high quality scanning service for our customers. We have the capabilities to scan any sized documents from index card size to large scale drawings. We will meet your scanning guidelines, timeframe, preferences about document formatting and arrangement. Pricing is based upon prepping requirements, scanning resolution, and indexing specifications. Simply call or E-Mail our office for a prompt quote. Are boxes of paper documents piling up in storage frustrating you? TKB Associates, Inc. can provide preparation and scanning services at your facility so documents never leave your office. This is sometimes required for very sensitive documents or documents that are accessed continually. We have personnel and equipment ready to handle on-site projects of all sizes. Our on-site services are suitable for your back-file or day-forward conversions. Are you tired of over stuffed cabinets or running out of space? If you are implementing a new imaging system, our analysts will work with you to define image quality, resolution and formatting specifications for your scanned documents. Or, for existing imaging systems, we will work with your systems integrator to provide you with images and data that can be readily imported and made available to your users. Outsourcing your document scanning requirements to TKB Associates, Inc. reduces the need for costly hardware and software expenditures, technical maintenance, and staff recruitment and training. Our service bureau scanning center can accommodate the peaks and valleys of your business volume providing consistent turn-around at minimal cost. TKB Associates, Inc. offers a wide variety of conversion services. In addition to minimizing your need to invest in equipment and personnel, we optimize your investment in scanning services by providing you image and indexing formats that are ready to import into your LaserFiche Document Imaging System. We take your documents right from your files and perform any preparation required for scanning. We also offer complete reassembly so your documents return to you exactly as you sent them. Document Scanning. TKB Associates, Inc. offers scanning services for documents of all shapes, sizes, and types. We can handle documents ranging in size from business cards to large format E-Sized drawings. Image Clean-Up. Documents will be scanned using high speed scanners with image enhancement technology providing automatic contrast and intensity of settings thus producing an image more legible than the original. Image Indexing. 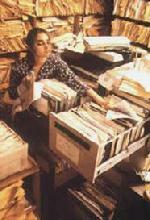 To efficiently search and find documents scanned into your system later you will need indexing. TKB Associates, Inc. can provide fast and accurate indexing services to documents scanned so that you may go directly to a particular document when needing to retrieve it. Some examples are name, date, social security number, resolution number, ordinance number, incident number, chart number, etc. Scanning Text with OCR. TKB Associates, Inc. can provide OCR (Optical Character Recognition) to create full text indexes of scanned images thus giving a very powerful means of retrieving by full text content. This will allow words, phrases, and numbers to be located and identified on documents immediately. Database Creation. TKB Associates, Inc. has software that enables our service bureau to populate a LaserFiche database from external sources such as MS Access, MS Excel, SQL or any other program that can produce compatible source files. We have gone to great lengths to ensure enough flexibility to accommodate a vast array of external sources. Our Database Creation software can create folders, place documents within the folders, name documents, and populate the index templates. Data Conversion. If you currently have a document imaging system that is out of date or utilizes proprietary image storage formats, TKB Associate, Inc. can convert your current imaging information to LaserFiche. Some of the systems we have converted are Canofile, eCabinet, FileMagic, PaperVision, DocStar, and OnBase. Call us at (708) 478-4100 or E-Mail us for more detail. Tired of trying to read images on this?? Microfilm / Microfiche Conversion. 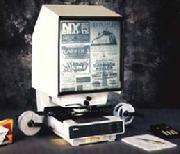 TKB Associates, Inc. provides microfilm/microfiche conversion services. All types of microfilm/microfiche including jacketed and COM, can be converted into various digital image formats by our state-of-the-art digital conversion equipment. Simply send us your film or fiche and we will send it back to you on CD/DVD, complete with the software to search, view, E-Mail and print! Are you looking to purchase a large format scanner?? Large Format Scanning. TKB Associates, Inc. can convert your large format documents to digital images. Maps, engineering drawings, and other oversized documents can be scanned, indexed, and stored to CD/DVD. These large format digital images can be stored on CD/DVD for archival purposes or imported into your Laserfiche Document Imaging System. CD/DVD Creation. TKB Associates, Inc. will use LaserFiche Plus to make publishing documents to CD/DVD simple. This allows us to immediately create a CD/DVD of your documents bundled with LaserFiche's state-of-the-art search engine. Upon completion of scanning and indexing of documents at our service bureau center we will provide (2) CD/DVD's per volume. One will be delivered to your office for daily use and one that we will keep at our safety deposit box for back up in case of a catastrophe such as theft, fire, flood or other natural phenomena. Also providing security from records being lost, stolen or misplaced. Each CD/DVD will be labeled with database name, type of files, date of archive, and volume.